Pt Mollie: Running in the dark- Go for it! Running in the dark- Go for it! Autumn has arrived and runners now have to battle cold temps and lack of sunlight for their outdoor runs. The change of season hopefully won’t affect your training schedule. Although seasonal changes are a good reminder to periodize your regime, here are some tips for running in the dark so you feel safe and motivated. · Find a running buddy – Not only will this get you out of bed at 6:30am but it also will be more fun to have someone to talk to and compete against. Take turns planning routes and setting Fartleks to keep your training sessions fresh. · Wear light colours and/or reflective gear – You want cyclists, pedestrians and automobiles to be able to see you. If they see you, there is less of a chance they will hit you as you cross the street. Nobody wants to end a run flat out on the ground. · Change up the route – Vary the times you run and the routes you take. It will make your training interesting and will avoid the locals at the pub to expect you to run by at a certain time. · Enjoy the sounds of the city – When running it is best to be aware of your surroundings to avoid collisions with those cyclists, pedestrians and automobiles (it is a two-way street, after all). Leave the MP3 player at home and have a listen to what is around you. Although the beat might help you stay on pace, you can take this opportunity to focus on your breathing pattern and technique. 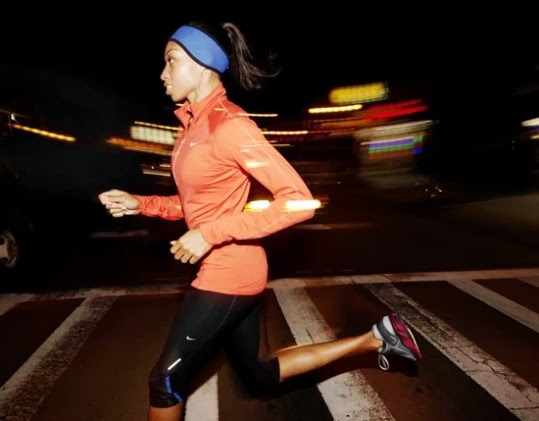 · Stick to populated areas (not dark deserted parks or canals) – Run along main roads that are brightly lit if you are by yourself. Avoid dark alleys, deserted parks, and unlit canal paths. If you think you are being followed, run to a public place, like a shop or restaurant, and have a quick rest. · Tell a friend where you are going and when you will be back – Just like a blind date with someone you met on the internet, you want to let your flatmate know where you are going on your run and how long you will be. If you aren’t back by a certain time, they will be able to use that info to retrace your steps. Hopefully they will never need to do so but if you have an unexpected injury, you will be grateful! · Find a local track – Training on a track is fantastic for speed work as well as endurance training. You will know exactly how far you ran as well as meet others who are passionate about running. The UK Running Track directory (http://www.runtrackdir.com/) can help you find one. · Run to work or after work or during work – Kill two birds with one stone and run to or from work. It will save you some money and lessen your impact on the environment. If you are lucky enough to have a shower at work, squeeze in a run mid-day to relieve stress from your morning meeting. Just because we are in for a long winter, doesn’t mean you need to quit running outdoors. Hopefully the tips above will help you stay on track. Anytime Sara! Glad to hear you are back at it!